Create beautiful Easter basket cookies with ease. This is a great icing project for beginners because it doesn’t require making royal icing. Buttercream icing is perfect and the store-bought icing right out the can works great! 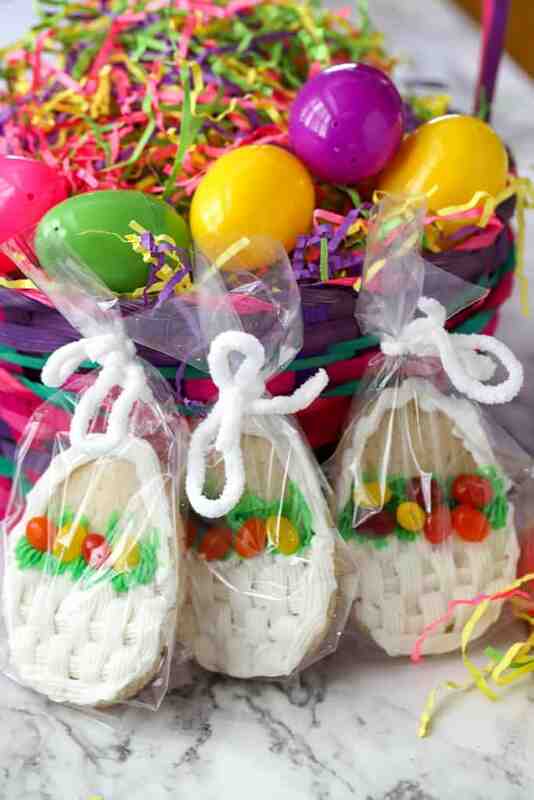 Use a weave pattern to make the basket then add green grass and jellybean eggs. 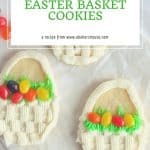 Aren’t these sweet Easter basket cookies? The best part is that they weren’t hard to decorate– at all!! I am a beginner when it comes to icing techniques for decorating cookies & cakes with buttercream icing. Cross cookies decorated with royal icing make a beautiful choice for Easter cookies too. 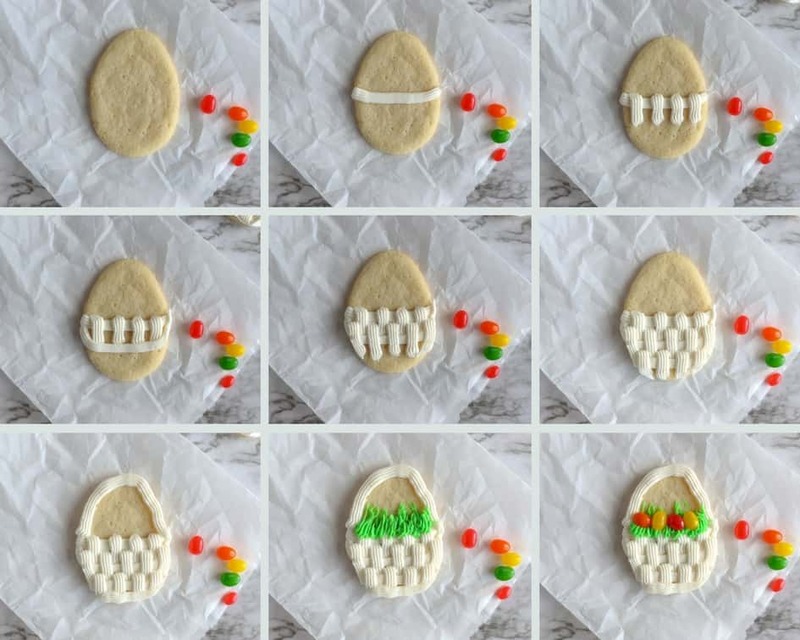 How do you create a basket pattern on these Easter cookies? This basket weave pattern is created with careful attention to the order and placement of each row of icing. Practice the pattern on a piece of bread first. It’s much easier to grab a piece of bread instead of baking up a batch of cupcakes for icing practice. 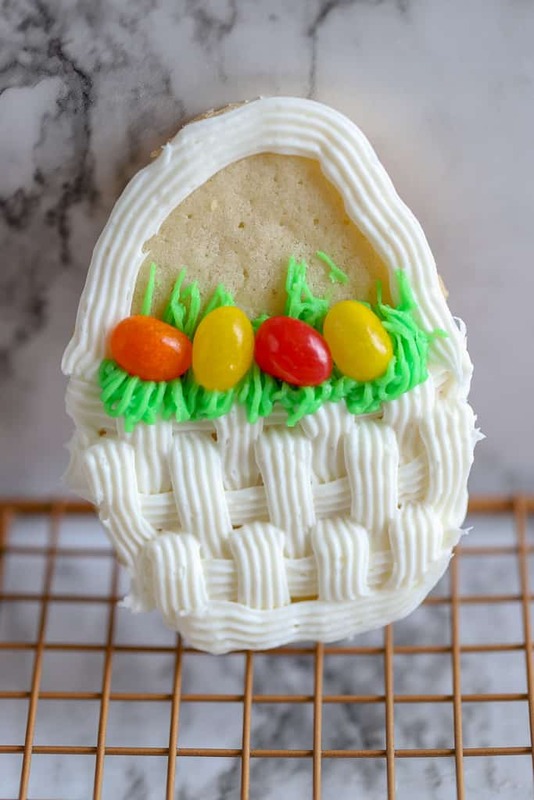 You’ll get the hang of the basket weave in no time, then you’re ready for these Easter basket cookies. What kind of dough should I use for sugar cookies? Use any cookie dough recipe you like. 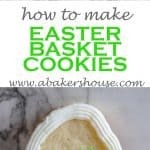 Refrigerated store-bought cookie dough is the shortcut taken here to make these Easter sugar cookies. The cookies baked in 12 minutes, cooled and I was ready to try my hand at icing them. Note that the dough expanded A LOT in the oven. No worries, simply press the egg cookie cutter into the baked cookies as soon as they come out of the oven to give your egg shape new life. Icing tips make this project special and provide that basket texture look. These are the two icing tips I used came in a pack together— the basket weave tip (number 47 for Wilton) and the grass (or hair) icing tip (number 233 for Wilton). Are you on Pinterest? I am! Click here to save this pin! Pipe with a disposable icing bag and make one horizontal line of icing. Space out vertical lines across the width of your basket. Continue to the next row by adding another solid horizontal line of icing at the base of your vertical lines. Fill in the gaps by placing vertical bars of icing that overlap your horizontal line. Continue to the bottom of your basket. Create a basket handle with a line of icing around the top. Add some “grass” with green icing using the grass tip. Squeeze the icing such that a small bit builds under the tip then pull upwards to create the pieces of grass. 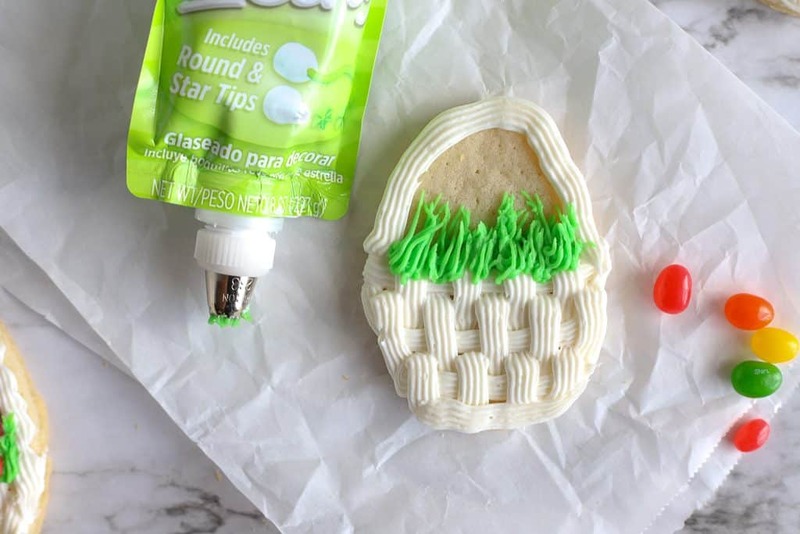 Dab dots of icing on some jellybeans and add them as the eggs to your Easter basket. Let the cookies dry uncovered overnight before storing them. 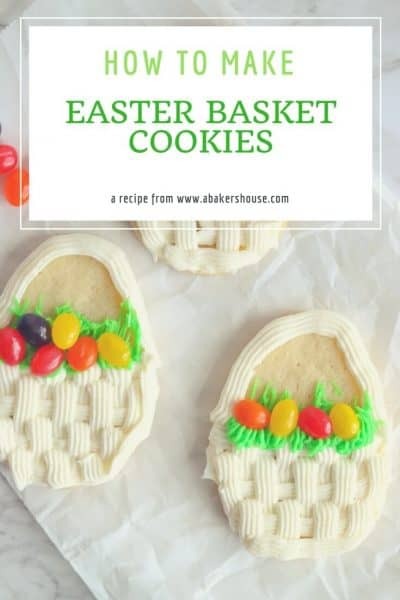 These Easter basket cookies make a great Easter gift. Place them in plastic gift bags and tie with a ribbon or yarn. Oh so festive and pretty! 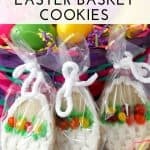 Easter Basket Cookies originally posted in March 2012; updated in March 2018. Love how darling these cookies are too. New follower. Have a lovely day! I love it and it is easier than I would have thought! That’s great! So glad you tried it and had success! Thanks for your comment. Super cute! 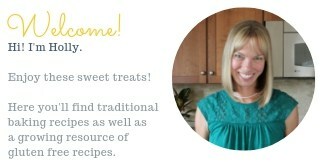 I can’t wait to include them in my Easter sweets roundup on Monday! Fantastic! Looking forward to seeing your Easter treats! Looks super cute.. thanks for sharing !! Super cute! Thanks for sharing it again, I would have missed it otherwise. These are incredible Holly. And great step x step instructions. Pinning this one for the world to see. These are delightful, such a cute idea and my son will love making them with me. So sweet Holly! 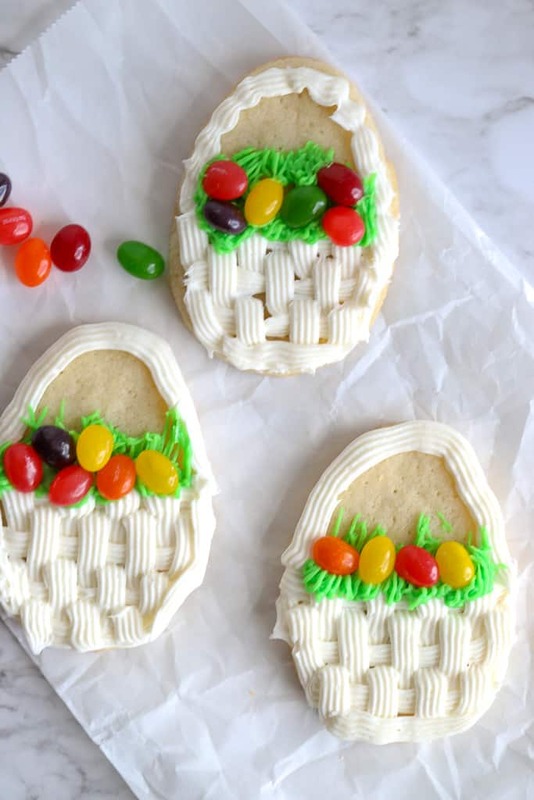 I love all cookies but I especially love them when I can also have them with jelly beans!